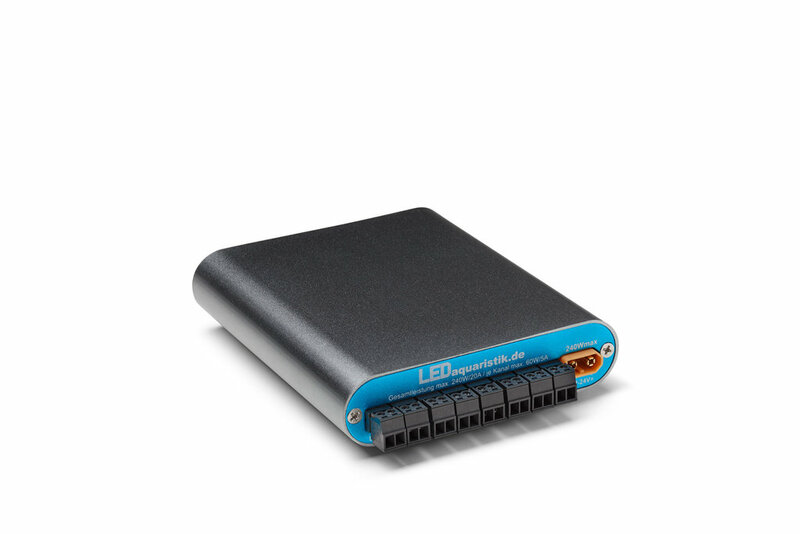 This device was developed in-house and is supplied exclusively by LEDaquaristik! Test it now in the simulator online! 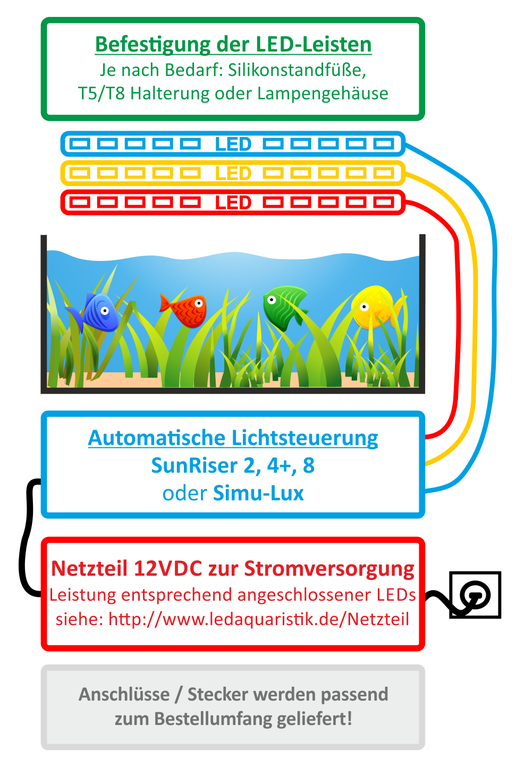 The SunRiser 8 allows you to control your LED aquarium lighting exactly how you like. The device and its intuitive software interface makes its operation child's play. Slowly increase the brightness in the morning and create your own sunrise. Move on to intense midday light then simulate cloudier conditions when the light is temporarily reduced during the afternoon. With perhaps effects like a brief thunderstorm and flashes of lightning? Let the day fade away in the evening with a gentle sunset, then have subdued moonlight throughout the night. These are only some of the possibilities open to you. The system can be programmed to suit your requirements and the light colours you have available, and extended at any time in the future. Operation and programming could not be any simpler over your local network and can be done using a web browser and end devices such as smartphones, tablets, PCs, notebooks etc. Programming knowledge is not required! FAQ: Which LED bars and light colours are needed for light control / daylight simulation? RJ45 connection for integration into the local network. Internal 4GB microSD for storing the configuration and running time data. Reset button for factory reset. Separately settable daily sequences with any number of time windows for each channel. If required, every weekday can be separately and individually programmed! SmartControl  the LEDs are never controlled at maximum voltage, thus ensuring an optimum service life. Simple creation of daylight and weather simulations with sunrise, sunset, moon phases, rain, clouds, thunder and lightning! Update over the Internet (optional, you don't have to update the device). Automatic integration into any IPv4 network with DHCP. Automatic clock synchronised over the Internet using NTP. Open-source software, customer additions are possible, continual further development with customer feedback. The SunRiser 8 only needs a local network connection for access (setup, program modification). An internet connection is only necessary for an update of the firmware. The actual operation at the aquarium can take place offline. The operating software and all settings are located locally on the SunRiser 8. The SunRiser 8 has a LAN port, no Wi-Fi. The SunRiser 8 is connected to your router via LAN cable and can therefore be reached via Wi-Fi. If no network connection is available in the area of the aquarium, a "Wi-Fi Bridge" can help. So you create a network access at any place by means of WLAN to LAN Repeater or comparable devices, socket presupposed. If there is no need to regularly access the SunRiser 8, a longer LAN cable can also be used if necessary. Firmware updates with additions and improvements appear regularly and are free of charge! The SunRiser is also compatible with other manufacturers' LED lighting. To operate the complete lighting system requires one LED mains adapter, which we can provide you with here. Please note as well that to operate up to eight LED bars does not require an additional adapter/distributor. The LED bars are connected directly to the SunRiser 8! The necessary plugs are included. Source: The SunRiser 8 software is based on the following open-source products: jQuery, Moment.js, Font Awesome, Snap.svg, Google Open Sans WebFont, Tipr, CMP, ChaN FatFs, lwIP, libopencm3, tiny printf and many other open-source projects.